What is it with us that we often rather jump onto a 12 hours flight across the world to see the amazing foreign landscapes rather than jumping into the car and drive a few hours to see a neighbouring country? I don’t know about you, but I often have the feeling that I’ve seen more of South East Asia or Australia than of Europe. After returning from an amazing trip in New Zealand and Australia couple of weeks ago, we promised ourselves that it was about time to explore more of Europe. And after 10 days big city life in Barcelona, we packed our carry on bags, rented a car and drove all the way from Munich to South Tyrol to road trip and explore this incredible region south of the Alps and home to some of the most incredible landscapes in Europe! 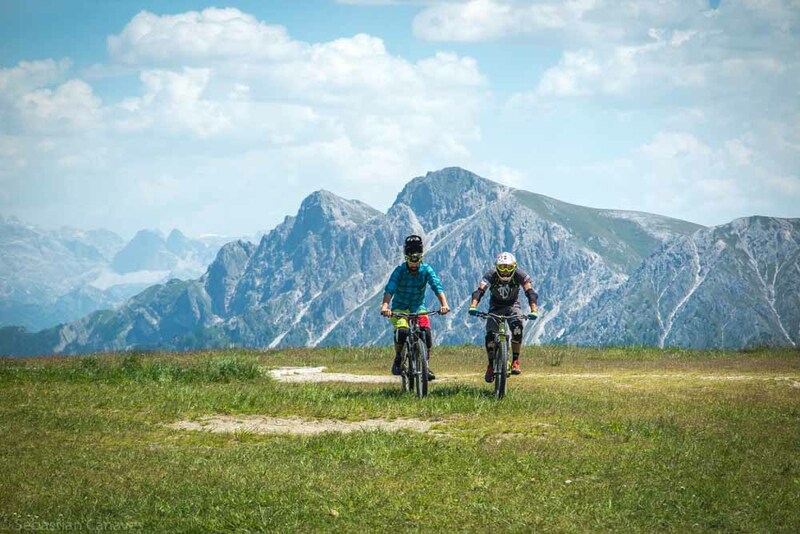 In South Tyrol everyday a new adventure was waiting for us and you can easily experience the same adventures: from climbing a mountain and down hill biking, to rafting and paragliding and much more! And there’s even more to South Tyrol! Stunning views, super delicious food, great coffee and amazingly friendly people! We’ve started our trip flying to Munich, where we’ve picked up or rental car and started making our way down to a small town called Vipiteno (German: Sterzing). This route took about 3 hours and we also had to cross Austria to get all the way from Germany’s south to Italy’s beautiful northern part called South Tyrol. When travelling this route by car you have to get a badge to use Austria’s high way, which you can get at almost all patrol stations near the border and costing 8,70 Euro for 10 days. Our first stop was a traditional South Tyrollean farm where all food is produced locally. More than 20 years ago the owners of the farm decided to turn their home into a restaurant providing guests with typical, self-made South Tyrollean dishes. And this is where our South Tyrollean food adventure started! I don’t even remember how many dishes we had, but trust me, it were many and every single dish was super delicious! I also never sat that long in a restaurant, eating, drinking wine and just having a good time with friends. But at Pretzhof, there is no other way than simply enjoying your food and the amazing views to the fullest. We first had typical South Tyrollean Schüttelbrot accompanied by various spreads, a cold meat and cheese platter, a yummy kohlrabi salad as well as fruity Italian olive oil and Balsamic vinegar. This followed by a typical soup with bacon dumplings, some more traditional dumplings as well as a selection of cooked meat including veal, beef goulash and a leg of lamb – all super delicious and very tender! For desert we had yoghurt with strawberries and, of course, an espresso macchiato! However, the best thing about the Pretzhof is it’s sustainable philosophy and concept, as really all product are made by the farm itself or sourced from local producers near by. This is also reflected by the menu, as there simply is none. The owner will tell you what they can cook for you the very day you visit, making sure that you only get seasonal and very fresh products! After one of the best (and longest) lunches I’ve ever had at Pretzhof, we continued our way to Innichen where we spent two nights at the Leitlhof. It took us about 1.5 hours to get from Pretzhof to Innichen and we already had some great views spotting the Dolomites! Once we arrived, our next food adventure was waiting for us with multi-course dinner which was just as delicious as our lunch before. Next to delicious dinner and an a great choice for breakfast, the Leitlhof also offers a relaxing wellness area with indoor and outdoor swimming pool, several saunas and baths and great views on the mountains. Using a lot of wooden interior, our Natura room was very bright and welcoming, had a cosy couch corner, a modern bathroom and separate toilette. I can only recommend the Leitlhof if you are looking for a relaxing and welcoming place to stay in the Hochpustertal of Dolomites! The next morning we were picked up by our guide Herbert from the Alpinschule Sexten Drei Zinnen to climb near by Mount Paternkofel. We started early in the morning at around 8 am and came back at roughly 3 pm. I must admit, I usually don’t hike but rather take a walk, but this hike was just fantastic! You make your way next the stunning Tre Cime di Lavaredo, climbing up all the way to the peak of Mount Paternkofel, crossing old tunnels from World War I and passing icefilds left from the winter months before. From the peak of Paternkofel you have even greater views on the Tre Cime di Lavaredo and the surrounding mountains of the Dolomites. Of course there’s is no other option than climbing all the way down again, until you`re back where you’ve started . And after such an adventurous hike of course you deserve a big glass of beer at one of the mountain huts – the very best ending to such a great experience! In the afternoon we went back to our hotel to relax in the outdoor pool and sauna area, before enjoying our next, yummy multi-course dinner. I usually don’t care too much about clothing, but luckily we got a few pieces of clothes sent from Jack Wolfskin before our trip to South Tyrol started. I never wore any clothes before that were specifically made for being active outside – don’t ask me why. But now that I’ve experienced the difference between ordinary and functional clothes, I must admit that I will slowly change my wardrobe and buy more of such functional clothes. It just feels like this type of clothes better fits my way of living and travelling and all the adventures I do. The trousers I wore for example are made of a certain fabric that dries very fast and my sweater was really comfy as well. But the best thing is that all clothes are really light, which is great when you have to carry them with you all day and travelling with cary on only! I always had the image that sporting gear is rather unfashionable but the outfit I got from Jack Wolfskin was very cool and it really matches the clothing style I usually wear! We started our third day with a little more fun adventure and went on a summer toboggan run! Ok, this might sound as a rather childish thing to do but you have to believe me, it is so much fun! The toboggan run in Innichen is quite long with 1,7 kilometres and you can drive up to 40 kilometres an hour! One single tour riding up the mountain with a gondola and then taking the bobsleigh down costs 14 Euro per person and is definitely worth the money! Afterwards we drove from Innichen to St. Vigil which takes less than one hour to drive. We decided to stop at the Pragser Wildsee (Lake Prags) to take a short stroll and enjoy the amazing colours of the lake and its cold water. On hot summer days this is where a lot of people come to cool off and visit the filming spot of a famous Italian TV series! Our fourth day was packed with adventures as we started zip-lining Europe’s largest and steepest zipline, offering amazing views 100 meters above ground. This zipline actually consists of 8 separate ziplines which take you all the way down from Kronplatz back into the town St.Vigil. We continued with our next adventure on a giant swing, meaning that I was swinging 15 meters above ground and looking down several thousand meters into the valley! So freaking scary, but also freaking awesome! But this wasn’t it…Afterwards I grabbed a mountain bike and went downhill biking! This was such a speedy and quite bumpy ride, but so much fun as well! I simply love downhill biking as it’s so fast and I can really feel the adrenaline running though my body – this is adventure I am talking about! Kronplatz is also becoming more and more popular among downhill bikers as there are several routs, from beginner to pro. The fifth day of our trip was one of our highlights as we had the chance to do a tandem paragliding jump from Mount Seceda. Our tandem partner was Samuel who really knows his stuff and is paragliding since more than 20 years already. We went up with the gondola, waited for the wind to blow a bit stronger, and off we went. It was amazing! It was perfectly quiet and the views on the surrounding mountains were stunning! Unfortunately my flight only took less than 10 minutes, but Line was able to stay in the air for almost half an hour! After all these mountain adventures it was time for a little urban adventure! So the next day we made our way Bozen, which functions as the capital of South Tyrol. It is a really pretty town with a cozy center, lots of shopping opportunities, traditional markets, hidden gardens and great restaurants. Make sure to take a stroll through the narrow alleys of Bozen’s old town and visit the upper corner of the Park Stazione next to Bozen’s main train station. If you are looking for a really good place to eat in a typical South Tyrollean setting, the restaurant Löwengrube is the right choice for you! After a day in town we continued our way up to Jenesien, which is a small village about 20 minutes from Bozen’s city centre located on the Tschögglberg. From here you have great views on Bozen and the valley and on the Dolomites in the distance. It is also a perfect place for hiking trips or for doing a horse ride on the regions’s famous horse breed, the Haflinger! We stayed at the Tschögglberger Hof and let me say this straight away: I’ve never felt as welcomed as here! Hedwig, the owner of the Tschögglberger Hof, is amazingly friendly, makes you feel very welcomed and not like a guest who is staying at a hotel, but like a friend who is staying at her home! And also the rest of the hotel is just great: the rooms are bright, spacious and offer fantastic views on the valley and the Dolomites, the multi-course dinner in the evening is super delicious and the breakfast and coffee is really good as well! The hotel also offers a wellness area with saunas and a steam bath, bike rentals, free tourist cards to explore Bozen, its attractions and museums, and much more! I still keep smiling when thinking about our time there and I can definitely recommend the Tschögglberger Hof to you! There are 5 horse riding stables in Jenesien and the region is great for taking a horse ride. We went on a 2,5 hours trip in the mornings, riding through the forrest and along green meadows, always enjoying great views on the surrounding mountains. In between we also rode in trot and did a few fast canters across a field – it was so much fun! The horses are really well ridden, sensitive and yet very calm. Perfect for both beginners and advanced riders. Our guide Sigi was also super friendly and doing a great job, telling us more about the region and making sure we are safe with the horses. If you love horse riding, this is where you have to do it! We simply got in touch with Hedwig from the Tschögglberger Hof and she organised the trip for us. The stable was only 5 minutes walking from our hotel, so we could easily go there after our breakfast. Unfortunately, the day we originally wanted to take the riding trip it rained so we had to come back a few days later which was no problem thanks to Hedwig’s help! From Bozen and the Tschögglberg we continued our trip to the Vinschgau Valley where we stayed two nights at the Seehotel Reschen. The Lake Reschen is an artificial but very beautiful lake. The lake is known for the old church tower that stands out of the water being the only building left to see after the former village Graun was flooded to create this lake. From and around the lake you have some amazing panoramic views on the surrounding mountains. And you’ll never guess what we’ve did there…we’ve learned kite surfing! We did a two days beginner course with the kite surfing school Proboarder and started with theory and some dry training the first day. We learned how to control our kite, how to start and land it, and how to be safe while being on the board. The second day the weather, or let’s say the wind, got a lot better so we continued with some advanced dry training until it was time to go into the waters for the first time – and it was so much fun! We just had to control the kite in front of us, make it fly from one side to the other, so that it would drag us through the waters. You won’t believe how much power such a kite can have and, at the same time, how easy to control it is. I could have done this exercise for hours and hours as it was so much fun! Unfortunately, the wind kind of stopped and it was time for us to continue our trip driving to our next stop. At the end of our trip it was time to explore the small but beautiful town Meran where we stayed two nights. Meran has a great Italian flair, a really pretty centre and old town and a large thermal bath where you can relax and swim. There are good shopping opportunities in Meran as well and you should definitely visit the grocery store called PUR which only sells traditional products and food from South Tyrol. The shop also has a bar where you can try food and drinks, and a cellar where typical South Tyrollean bacon and cheese is stored. If you are looking for a good restaurant to eat South Tyrollean dishes try the Restaurant Sigmund and if you are fond of an authentic, Neapolitan pizza, make sure to visit La Smorfia – such yummy pizzas and a great atmosphere at their terrace! The Villa Bergmann is an old town house which just recently has been renovated by two architects and now opened as a hotel. The villa has several apartments which are all very bright and spacious and use traditional yet modern furniture. The Villa Bergman is perfectly located in Meran’s old town and you can easily walk from here to major attractions. It is managed by Eva, who welcomes and takes care of you doing your whole visit. In the mornings she prepared a lovely breakfast for us, made us tea and coffee and told us more about the villa and Merano. Her husband seems to be a talented cook and loves food as he prepares the super delicious jam you’ll get for breakfast. But he also prepares a special mint syrup that Eva mixed with sparkling water and offered us as a welcome drink – absolutely yummy and refreshing! The next day we got up early to meet Erwin in St. Martin, which is about half an hour driving north from Meran. Erwin created a super cool adventure park next to the Passer river, where you can do tarzaning, canyoning, river walking or abseiling next to a waterfall. We joint him for two hours of tarzaning, where we had to climb, absail, zip-line and even jump from 15 meters in a tree such great fun and such an amazing adventure! Afterwards we went for a really delicious lunch at Gasthaus Lamm in St. Martin! On our last day South Tyrol was waiting with one more, great adventure for us: rafting! Our rafting trip was planned for the afternoons so we used our time in the mornings to do the horse riding trip at Tschögglberg near Bozen, which was cancelled the days before due to rainy weather. So after our great horse trek it was time for our final adventure! We went rafting with Südtirol Rafting and after some short safety instructions at land we jumped into the waters! We went rafting for nearly 3 hours and it was great fun! We stopped for some swimming in between and drank a few beers with the team after the rafting trip. If your up for some fun water sports, don’t miss this great adventure! Have you ever been to South Tyrol? What adventures would you love to do in this great region? *This road trip was supported by our friends from Südtirol Marketing. However, all opinions remain our own.